Kit-single point install Wall mounting for projector S300/S300Wi/S320/S320WiEliminate hassles during maintenance with this Wall Mount from Dell™ for single stud applications. 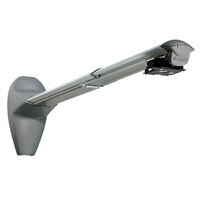 It enables easy installation and provides a convenient way to mount your projector on desired location with ease. Moreover, it saves precious desk space and avoids clutter. This product has been tested and validated on Dell systems. It is supported by Dell Technical Support when used with a Dell system. Eliminate hassles during maintenance with this Wall Mount from Dell™ for single stud applications. It enables easy installation and provides a convenient way to mount your projector on desired location with ease. Moreover, it saves precious desk space and avoids clutter. This product has been tested and validated on Dell systems. It is supported by Dell Technical Support when used with a Dell system.